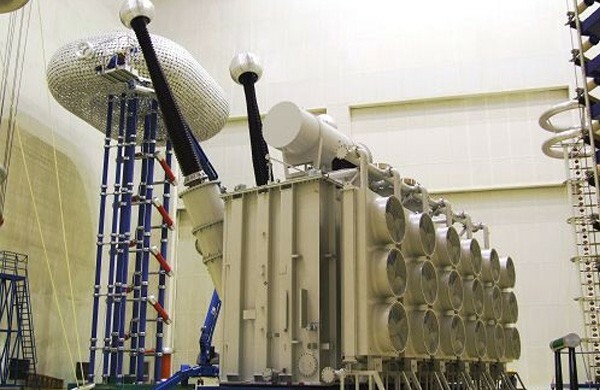 Large power transformers (Ultra high voltage and big capacity) are used in electric power systems. Industrial and residential large power transformers (single phase or three-phase) that operate at the line frequency are designed to handle high voltages and currents. Efficient power transmission requires step-up large power transformers at the power-generating station to raise voltages, with a corresponding decrease in current. Line power losses are proportional to the square of the current times the resistance of the power line, so that in order to reduce losses very high voltages and low currents are used for long-distance transmission lines. At the receiving end, step-down large power transformers reduce the voltage, and increase the current, to the residential or industrial voltage levels. CTSS, as an reputable electrical power equipments manufacturer, supplier and exporter all around the world, always digests and absorbs the advanced manufacture technology, accordingly develops on its own hands 500kV transformers (three phases and single phase) on the basis of CTSS` own experiences and advantages. Ø Electrical insulation: Power frequency electrical field calculating software and lightning over-voltage winding potential distribution calculating software for calculating of gradient distribution of main insulation, longitudinal insulation and impulse voltage in the windings as well as that of winding terminals. Meanwhile, appropriate magnetic flux density and the auto-oscillation frequency of cores are selected for lowering transformer’s sound level. ² Optimize winding transposing to effectively reduce load losses and eddy current losses as well. ² Zigzag oil conduit structure to lower average temperature rise and the hot-spot temperature rise and thereby extend transformer’s service life. Ø Core structural parts: decrease the stray losses by lowering eddy current losses, drawing plates of core or minimizing slots on the basis of the location of core structural parts. Ø Transformer tank: combining magnetic blocking and copper blocking methods to reduce the stray losses. Application: 500kV power system of power plant, power house, generating station, power station, substation, mining enterprise and etc.